A big deadlift is essential for building full-body mass and strength. So today I’m passing on some awesome tips from strongman and body transformation expert, Jim “Smitty” Smith. Smitty knows how to build some serious muscle and strength. He’s spent an incredible amount of time in the trenches and he’s an expert advisor for Elite Fitness Systems and Men’s Health. CW: Ok Smitty, before someone puts effort into boosting his deadlift he must first figure out if there’s a problem. How do you access the correct deadlift technique from the start? Smitty: There are three primary elements to consider when correcting deadlift flaws. First, is the person missing the lockout? Second, are the knees buckling in with sumo deadlifts? Third, is his missing off the floor? CW: I agree that those are three common problems. How do you fix them? Smitty: First off, you have to deadlift with good form. If your form is off, it will lead to you missing the lift, typically right off the floor. There are seven things to consider right way. 1. Shins on the bar – you must make sure you’re as close to the bar as possible. This shortens the distance between the center of gravity (COG) of the bar and the COG of the lifter. This is the most advantageous leverage position. 2. Big air – you have to catch a big air in your stomach to increase intra-abdominal pressure. This is an essential step for immediately boosting your strength. 3. Push your abs out – when you push your abs out (after sucking in a lot of air) it will provide you with a natural belt to ensure your lower back and abdominals are braced strong. This technique is further enhanced when you actually wear a belt because you’ll be able to force your abdominals out against the rigid belt. 4. Don’t jerk the weight off the floor – instead, push the floor away after you develop a high level of full-body tension. 5. Push your knees out – as you stand up, push your knees out to the sides to keep them from buckling in. 6. Keep the bar against your body throughout the lift – this, again, maximizes your leverage so you can lift more weight. 7. Lockout with a powerful glute contraction – don’t hyperextend your lower back. Lockout your hips by forcibly contracting your glutes. CW: Good stuff, let’s move on. Some technique problems are due to a guy (or gal) just being plain weak. Which factors do you consider most important for building strength that carries over to the deadlift? Smitty: To develop full-body, deadlift strength you must focus not only on your posterior chain, but also your core strength, upper back musculature, and grip. This time, there are four factors that need special attention. 1. Strengthen the posterior chain – Romanian deadlifts, stiff-legged deadlifts, glute-ham raises, reverse hypers, partial range lockouts (rack lockouts), and deadlifting while standing on plates will all lead to huge improvements. 2. Strengthen the core – compound movements, L-sit pull-ups, medicine ball exercises, and the ab wheel are all effective ways to develop the core. 3. Strengthen the upper back – face pulls, pull-ups, seated rows, and bent-over rows work best. 4. Strengthen the grip – the thick bar hold, rack hold, and plate pinch all work great. Also, use an unmixed grip (both palms facing down) for as long as you can while working up your deadlift poundages. CW: I give that checklist my “thumbs up.” Anything else that’s vitally important? Smitty: You bet. The last thing I want to tell your readers is this: to pull heavy you must be mentally prepared. When you approach the bar you have to be ready to pull the trigger! Right now Smitty is offering a discount on his outstanding system, AMD 2.0. If gaining size and strength is your goal, I highly recommend that you check it out by clicking HERE. Chad-great article!! i own a trap bar can i get by with this? my goals at 60 are to use coumpound lifts to stay healthy. CW: Trap bar deadlifts are awesome. It’s the best alternative for most people. Can you elaborate a bit on why and how to fix the problem if your knees buckle on sumo deadlifts and how this relates to traditional deadlifts? CW: Sorry Ty, that step was left out of the original post. It’s in there now. Another method is to wrap a stretch band around your legs on the outside of your knees to force your outer hip muscles to pull your legs apart as you squat or deadlift. Great article but what is a weak deadlift? CW: That depends on who you ask. Generally speaking, if your deadlift is less than twice your body weight it could use some help (a 200-pound guy should eventually be able to deadlift 400 pounds). Excellent article Chad and Smitty. Do you recommend a hook grip when deadlifting or a traditional grip? CW: I recommend an unmixed up. For your super heavy sets, use straps if you need them. I had an L5/S1 discectomy (disc trim only) a few months ago. The operation has been a success. Are my dead-lifting days over? I have a trap bar. CW: Your doctor/therapist has to answer that question. 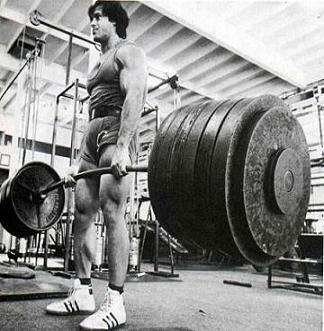 Although, I don’t see why a trap bar deadlift would be a problem if you start light and slow. I’ve been experiencing some lower back pain from dead lifts. I try my best to involve my glutes and hamstrings during both the ascent and the descent, but somehow manage to feel intense pressure in my lower back. The soreness disappears 5-10 mins after the set. CW: It’s hard to target the problem with that description. My guess is that your hip flexors are too stiff. In addition to the pre-workout mobility drills, try the stretch outlined on page 80 before sets of the deadlift. When I focus on keeping the bar as close to my body as possible my shins get battered by the bar on the concentric portion of the lift and are bruised the next day. I am doing this wrong or will my shins just toughen up over time? CW: You’re doing it wrong. The bar shouldn’t hit your shins, especially not hard enough to bruise them.